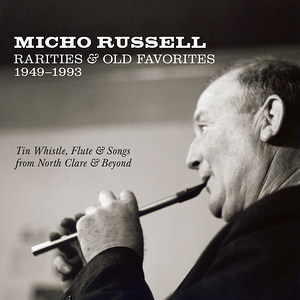 Micho Russell (1915–1994) of Doolin, County Clare, was an Irish national treasure. A farmer who became a performer during the folk music revival of the 1960s, Micho was as at home on stage as he was in front of his own turf fire. His vast repertoire of beautiful old tunes, personal warmth and utterly unique approach to playing the tin whistle won him a loyal and enthusiastic following wherever he went. This double-CD was issued in honor of Micho’s centenary. The 92-minute album has forty-nine tracks, of which only five have been released before. Selections range from humble home recordings made on simple equipment to professional recordings made using some of the best technology available at the time. The vitality and originality of Micho Russell’s music are the unifying themes that shine throughout. The album begins with a rare 1949 archival recording of Russell made by Séamus Ennis and the Raidio Eireann Mobile Recording Unit on an acetate disc. Other highlights include recordings of Russell playing for house dances with fellow Doolin musicians, selections from an informal 1969 recording session at the home of English folk music producer Bill Leader, and tracks of Russell recorded at folk festivals in Germany in the 1970s. Studio and live performances digitally recorded on Russell’s last trips to New York in the 1990s are woven throughout the two-disc set. This historic recording will be welcomed both by the Clare musician’s longtime fans as well as by those who have yet to discover the joy of Micho Russell’s music. The album includes a 16-page booklet.